In theory, the clustering results because causal biological effects (e.g., nutrition and genetics) tend to act on general brain functioning and so foremost affect general ability and so tend to induce g-driven difference which produce g(+) effects, while casual cultural effects (e.g., test-training and better schooling) tend to act on localized mental functioning and so foremost affect specific abilities and so tend to induce specific factor-driven differences which produce g(-) effects. Obviously, from the above, one can’t deduce that moderately to strongly g(+) or g(-) differences are, respectively, causal biological or causal cultural. But one can, nonetheless, infer this. And the strength of the inference is dependent on the strength of the association between g-type and causal class. For example, the correlation coefficient (r) for the 14 examples above, dichotomously coded as biological =1, cultural =0 and g(+) =1 and g(-) =0), is r >0.8. Inference is indeed possible! The situation, though, is more complex than presented above because some IQ score differences don’t represent latent ability differences; they are simply due to psychometric bias. The cause of this bias could be either, following our schema, biological or cultural. For example, IQ score differences induced by sleeping meds would be classed as causal biological and IQ score differences induced by low motivation would be classed as causal cultural. As the causes, though, are not influencing latent ability – just the measure of it – they would not be predicted to induce concordant g(+) or g(-) effects. The effects of low motivation and sleeping meds would be (predicted to be) orthogonal to g-loadings (g(0)), because these effects are not on latent ability and so do not act on specific abilities or general ability, per se. It’s tempting to infer that g(0) effects, then, implicate non-cognitive causes – causes that act by way of psychometric bias – but this is problematic since one can also get g(0) effects when one has both large general intelligence difference and large specific factor differences. There is, then, an ambiguous class of g effects, g(0) effects. Meng Hu and I reasoned that if color discrimination was driving the effects, then color should statistically explain most of the associations. We attempted to find proxies for genomic ancestry (rates of various diseases, etc.) in the few studies which also had color and IQ data but came up empty handed. In both the Add Health and NLSY97, though, there was information on IQ, color, and reported ancestry. Using (parental or self) reported ancestry as an index of genealogical ancestry, we were able to validate skin color as an index of European admixture in both of these surveys and to determine the extent to which color could explain the IQ-ancestry association. The finding was that, at least for African Americans, European ancestry was independently associated with IQ. I will review the Add health results for African Americans below. The attached excel file contains the syntax, variables, and filters used. We explored different methods of identifying African Americans. We decided to define a person as “Black” if in wave I and wave III they self-identified as non Hispanics Black and if in at least one of those waves they were interviewer identified as being Black. The latter stipulation was to preclude the possibility of pseudo Blacks, particularly Whites identifying as Black. Originally we had stipulated that a Black person was a Black person if and only if in both waves they identified and were identified as being Black. But we found that this was an overly exclusive definition. There were a number of semi-darkly pigmented individuals who consistently self identified as being Black but were inconsistently interviewer identified as Black, presumably because of ambiguous phenotype. An example of this situation is shown in table 1 in the excel file (not shown below). After deciding on a definition of Black, we defined White in a corresponding fashion. In wave III, individuals had the option of reported their national ancestry. The characteristics of individuals varied by those who did and did not report. As such, we restricted the analysis to only those who reported ancestry. 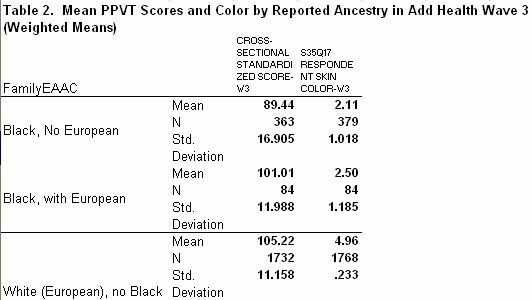 Table 2 shows the weighted means IQ and color scores of Blacks who reported only ancestry from a predominantly Black region (e.g., West Africa), Blacks who reported at least some European Ancestry, and Whites who reported only European ancestry. We then dichotomously coded ancestry as Black only/someWhite (FamilyEAAC) and correlated this with color and IQ in the African American population. Table 3 shows the correlations. All were significant. Following this we ran a hierarchical regression. FamilyEAAC was entered into the equation in the first step and skin color, the presumed proposed mediating factor according to the colorist model, was entered into the second step. 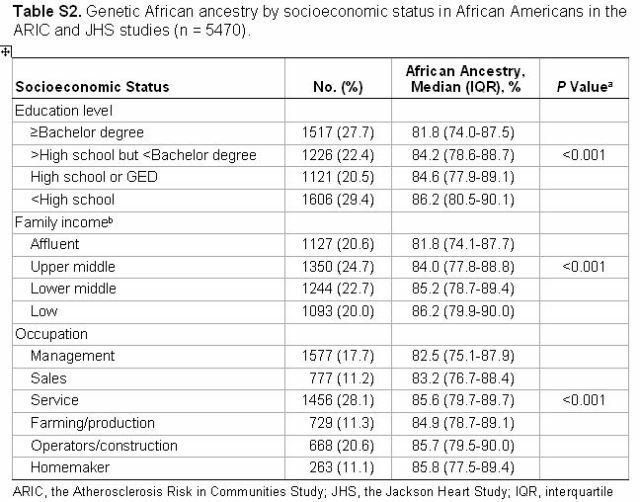 As shown in table 4, reported European Ancestry was a significant positive predictor of IQ, indicating that Blacks who reported European ancestry had higher IQs than Blacks who reported only African ancestry. 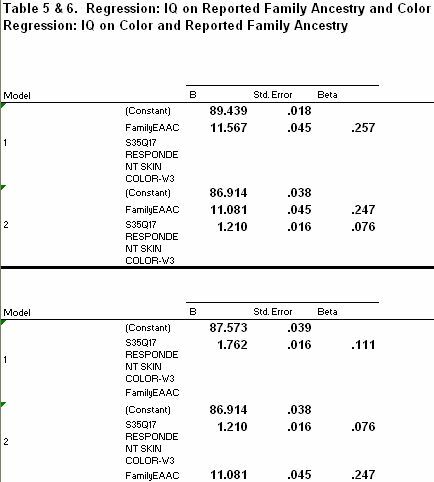 When skin color was entered into the model the statistical significance of FamilyEAAC did not change predictor, indicating that skin color did not practically significantly mediate the European ancestry-IQ association. Very similar results were found for the NLSY 97 in which parental reported ancestry was used as the index of genealogical ancestry. The results here weren’t surprising to us. They indicated that color discrimination can not possibly explain the association between IQ and reported European ancestry. They were also relatively consistent with our genetic perspective: The association between color and IQ was weaker than that between reported European ancestry and IQ. The weak association between color and IQ is a product of color being modestly associated with ancestry and of range restriction of White ancestry in the Black population. The typically found standard deviation of White ancestry for Blacks who have two Black parents is about 15%. The best r between IQ and color reported for US African Americans is 0.44. An increase in one standard deviations of color then will be associated with an increase in about 0.44 standard deviations in ancestry or about 6.5% of White admixture. Not much. 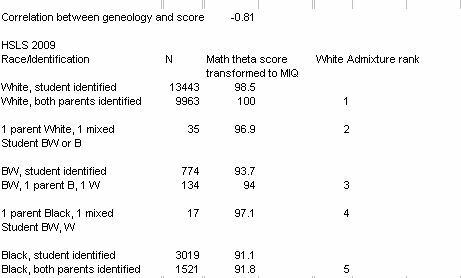 The association is stronger between reported ancestry and IQ because reported ancestry references recent admixture. People remember only 3-4 generations back – often less. To put this in perspective, a Black person who had two Black parents but was white in color (5 on a 1 to 5 scale) – that is, was 3 standard deviations more light than usual, would tend to have around 40% White admixture, which is the same amount as that of a Black person with one White (and three Black) grandparents. That is, reported ancestry tends to be more associated with admixture than is color. It is not surprising to us then that it is also more associated with IQ in the Black and Hispanic populations than is color. That said, there are a number of possible models that could account for the associations in question. Our aim here was simply to illustrate some limitations of the colorist one. Any idea what paper this article that claims research shows that IQ can vary by up to 20 points during the teen years is based on? Also, I have been told that studies show that scores for the same individual taken at different times after eating are different in consistent ways, which I interpret to be a result of blood glucose levels. However, does anyone know of the papers?